Nature Cat, Peg + Cat, Daniel Tiger and Katerina Kittycat are coming to WSRE’s neighborhood! PENSACOLA, Fla., January 11, 2019 ― Parents, mark your calendars! Your children will want to meet their favorite celebrity cats during upcoming family-fun events hosted by WSRE. 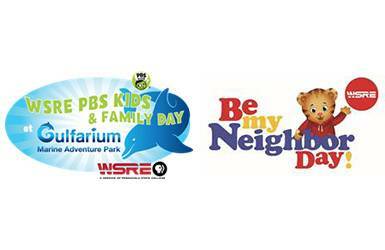 The public television station is bringing the stars of STEM-oriented children’s shows “Nature Cat” and “Peg + Cat,” along with Clifford the Big Red Dog, to the fifth annual WSRE PBS KIDS & Family Day at Gulfarium Marine Adventure Park on March 2. Daniel Tiger and Katerina Kittycat from “Daniel Tiger’s Neighborhood” are also coming to our neighborhood, along with PBS KIDS co-host Mr. Steve, for the second annual Be My Neighbor Day at WSRE on April 27. Hours for both events are 10 a.m. to 2 p.m. Gulfarium Marine Adventure Park will be open for the day during regular business hours and is donating a portion of the day’s admission fees to the WSRE-TV Foundation. Along with character meet-and-greet fun, children can engage in hands-on activities including arts and crafts and a scavenger hunt, while also taking in the park’s animal exhibits, aquariums and shows. Be My Neighbor Day is a free event which promotes early learning and the neighborly values of Fred Rogers. There will be performances by national PBS KIDS co-host Mr. Steve (Steve Roslonek), character appearances by Daniel Tiger and Katerina Kittycat, story time with WSRE TV on-air personalities and numerous indoor and outdoor activities and exhibitors at the WSRE Jean & Paul Amos Performance Studio on the campus of Pensacola State College. Corporate sponsorships are available. Contact Crissy Nettles at 850-484-1210 for details.